The crew of the Space Shuttle Endeavour have been working through Flight Day 7, as mission managers took the expected step of extending STS-130 by an additional docked day. Meanwhile, Bob Behnken and Nick Patrick continued outfitting operations of the Node 3 “Tranquillity” module during the mission’s second EVA (Spacewalk), which including a bit of drama via a small ammonia leak during one of Patrick’s tasks. In all, STS-130 has been an extremely clean flight, with only four (4) issues so far making to the Mission Evaluation Room (MER)-level of discussion, leading to the opening status of “STS-130 mission is proceeding nominally,” almost becoming a copy and pasted note via the engineers monitoring the mission. All FD-5 activities through FD-6 (Flight Day 6) have been completed to date as STS-130 heads into its first weekend of on-orbit activities. One expected decision by the Mission Management Team (MMT) was to extend the mission by the optional one docked day, which is a sign of a mission that is proceeding to plan. The additional day will allow for more time to be dedicated with work relating to both Node 3 outfitting and the troublesome Urine Processing Assembly (UPA). 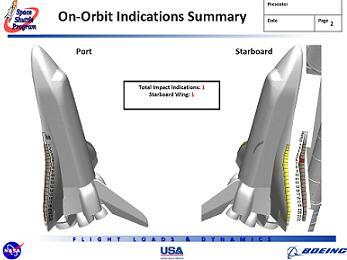 On the ground, both Solid Rocket Boosters (SRBs) are back at Port Canaveral and Open Assessment on the SRBs began Friday. It is expected that the video footage from both boosters will be available – and as tradition replayed on NASA TV – either on Sunday or Monday. This issue related to Behnken’s sudden loss of communication quality during the latter part of EVA-1, where he complained about the drop in volume for calls made by both Patrick and IV Steve Robinson. However, Behnken was still able to hear calls from CAPCOM in Houston, and the quality improved as he translated through the worksites. The only other items of note were three (3) new Mission Evaluation Room (MER) items – brining to total MER items for the mission up to four. The first new MER item pertained to the WLEIDS (Wing Leading Edge Impact Detection System) sensor – which originally appeared in the “funnies” category earlier in the mission. The WLEIDS sensors have played an impressive role since their Return To Flight addition to the fleet – literally allowing the orbiter’s to “feel” for any impacts during ascent, and for part of the on orbit mission. Some of the sensors – or accelerometers – have been added to other areas in the aft of the orbiters, allowing for additional data on the Main Engine Ignition (MEI) Acoustic and SSME (Space Shuttle Main Engine) Ignition Overpressure (IOP) Environments. The second new MER item related to one of the three TPS (Thermal Protection System) areas of interest – all of which have been analyzed by flight engineers and cleared for entry. Additional overviews via the Damage Assessment Team (DAT) will be rounded up in an upcoming article. The third and final new MER item was noted as “MER-04 OCA 48Mbps Not Available. Troubleshooting on this issue revealed that the MUX position switch is electrically latched to DTV position.” Again, this issue is minor and holds no mission impact. For the second of STS-130’s three EVAs, Behnken and Patrick were tasked with eight primary activities, prescheduled for 6-hours and 30-minutes to accomplish. To begin the EVA, Behnken and Patrick installed the now infamous NH3 (Ammonia) lines to the external cooling systems on Node-3/Tranquiltiy. The original NH3 lines – which failed one of the final qualification tests in January – have been replaced with more robust lines, created by welding smaller NH3 lines together. During the removal of a cap on a Quick Disconnect, Patrick noted he saw a small amount of ammonia spray out. Although he was checked by Behnken – who did not notice any contamination on Patrick’s suit – contingencies saw the English-born spacewalker “bake out” his EMU suit on returning to Quest on the appropiate timeline. After installing these lines, Behnken and Patrick covered the lines with the appropriate MLI (Multi-Layer Insulation) blankets before opening up the NH3 Loop B Quick Disconnects. 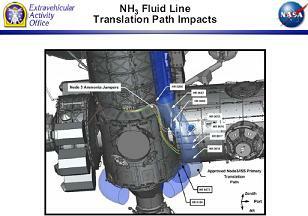 Soon after, MCC-H confirmed the lines were working as planned, “bringing Node 3 to life”. Following this activity, the spacewalking duo installed the Keel Pin and Trunnion covers to Node-3 before moving on to a handful of operations on one of Node-3’s Common Berthing Mechanism (berthing ports). The final three tasks completed on EVA-2 were the installation of eight handrails to the exterior of the Node-3, the installation of one gap spanner, and the installation of a non-propulsive vent. 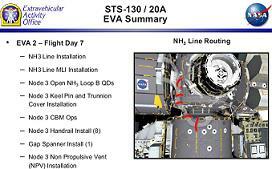 In addition to these EVA activities, the STS-130 and ISS crews will transfer an Integrated Stowage Platform, conduct internal outfitting activities of Node-3 (including IMV installation and the filling of water bus), and installation of ARED (Advanced Resistive Exercise Device). Following the completion of EVA activities, the Cupola module will be depressurized and then grappled by SSRMS (Space Station Remote Manipulator System) ahead of its relocation.